Because the black mold removal process will stir up a lot of dust and mold spores it is vital that mold abatement procedures are in place to provide containment for the mold infected area to prevent cross contamination. Residential mold remediation also should address solving any moisture and humidity problems in your home to prevent mold from returning. The list below outlines widely used and accepted guidelines for mold abatement procedures but each job is different and your mold contractor may recommend other remediation techniques for your specific situation. 1. The HVAC system should be shut down and remain off during the entire mold remediation process and all heating ducts and vents in the area should be sealed off. In some situations, where the residents are living in the house during remediation and where the area is isolated from the rest of the house or where there are no vents, it may be possible to leave the system on. But due to the risk of cross contamination it is much safer to turn it off and leave it off. 2. All moisture problems should also be remedied at this time so mold will not have a chance to grow once clean up is done. To eliminate moisture problems during mold removal dehumidifiers should be run in the area until the mold remediation is completed. 3. Furniture and other personal belongings should be removed and cleaned and then stored in a dry place until the job is completed. If furniture is not cleaned thoroughly and stored in an area with high humidity it is possible to reinfect the home. In some cases it is safer and cheaper to just get rid of furnishings like couches that have porous surfaces where mold can grow easily and replace them with new ones. 4. The mold remediation company you chose should next set up proper containment barriers to prevent mold spores from spreading. This will involve using plastic barriers to segregate the area. 5. They will also set up air machines to maintain a negative air pressure inside the containment area. HEPA air scrubbers should also be set up at this time and run throughout the process. 6. Also your mold remediator should set up a decontamination chamber where workers can leave their contaminated moon suits and other equipment. 7. Having proper mold abatement procedures in place is critical for the next step, which involves the actual demolition and mold removal process. 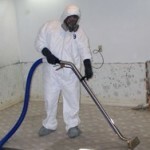 There are various methods of removing mold including wire brushing, HEPA sanding and air blasting and what your mold remediator uses will depend on the individual job. All mold infected materials must be removed from the area. Often they will be removed in sealed plastic bags to prevent spreading mold spores throughout the home. Common sense dictates the shortest and most direct means of removing this debris from the home. If it can be removed through a window in the infected area so much the better. 8. Your HVAC system should be cleaned to prevent recirculating any mold spores that may be inside it. This will involve cleaning all ductwork with HEPA equipment as well as air conditioning and heating units and replacing their filters. In some cases it may be cheaper to replace items like flex duct rather than try to clean them. Also if your plenum is wood it should be replaced. 9. Final mold clean up should involve HEPA vacuuming the entire area. Every surface in the area should be wiped down by hand with an EPA approved biocide. The air scrubbers should be left running for at least 24 hours after the mold remediation process is complete. In order to determine if your mold remediation was successful it will be necessary to perform a post remediation mold test. You want to make sure mold remediation was successful and that mold spore counts are at acceptable levels. These tests should not be performed by your contractor but rather by an independent certified mold testing company. If these tests are not successful then the mold remediation process must be redone until it passes. A failing mold test does not necessarily mean your mold removal contractor did a poor job or did not follow proper mold abatement procedures. It could mean there is still a hidden source of mold in the house. For your protection it is important to have a provision stating that if after the mold abatement procedures are completed and if your black mold remediation fails the mold test the contractor will fix the problems free of charge to you until the job passes.